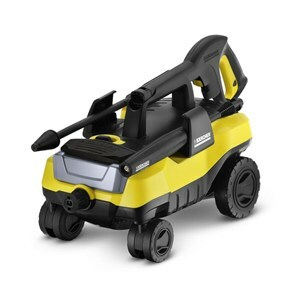 What Can We Say About Karcher Pressure Washers? If you have ever tried washing your porch, patio or car by hand, then you know how tiring these jobs can be. By using a power surface cleaner like a pressure washer, you can cut down cleaning time by half and use a lot less effort. Did you know you could extend the lifespan of a paint job on your home by at least 3 years – or even make it last 10 just by using a pressure washer annually? One of the most popular pressure washer manufacturers, the Karcher company, has more than 36,000 dealers in more than 160 countries. They provide many different cleaning solutions for residential and professional use. 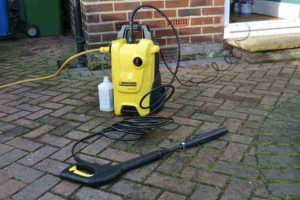 We have prepared honest and unbiased Karcher pressure washer reviews to guide you on your way of buying your very own pressure washer. 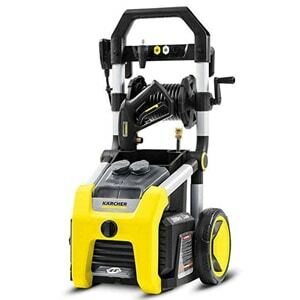 The first on this list is a four-wheel Karcher K3 Follow-Me electric power pressure washer. You can easily pull it around while you wash your house, windows, driveway or car. Basically, it can cover any light to medium cleaning jobs you might have at hand. It comes with a 15-foot high-pressure hose and a 35-foot power cord which allows you to cover a radius of roughly 7500 feet. It weighs around roughly 16.3 pounds, making it a small, compact pressure washer model perfect for household use. This power washer has a flow rate of 1.3 gallons per minute, and the pump itself works at 1800 PSI. The maximum water temperature that this unit supports is 104 Fahrenheit degrees. It comes with a Vario spray wand which allows you to control the pressure you are using. It’s suitable for most surfaces, including the fragile ones. The second attachment is a dirt blaster which is specifically designed to tackle rough surfaces like your patio, concrete driveway or stairs. It also offers a built-in detergent tank for an exceptionally thorough cleaning. The Karcher K2000 electric power pressure washer is a slightly more powerful cleaning tool than the first one on our list. It has a 2000 PSI pump with 1.2 gallons per minute flow rate. It weighs around 26 pounds and comes with oversized wheels strapped onto a solid frame. The movement is easy, and you can conquer any type of terrain – even the difficult ones. It comes with a set of 4 different quick connect nozzles that are able to handle any easy to medium cleaning jobs that require a deep, thorough clean. One of the best features of this powerful power washer is the fact that you get 2 detergent tanks. There’s a dial which you use to change between the detergent tanks you want to use. This pressure washer is designed so you could put it away easily as it has a bin for the attachments that come with it. The power cord can be wrapped around the handle for more convenient packing. Also, this unit has a pressurized reel that keeps a hose protected from the kinks and the marring. 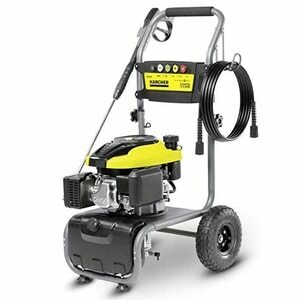 The Karcher G2700 gas power pressure washer comes from the performance series. It has a welded frame with 10-inch pneumatic wheels. It sports an output of 2700 PSI with a flow rate of 2.5 gallons per minute. All of that cleaning power comes from a gas powered 196cc engine. No need to worry about the power cords. It comes with 5 different quick connect nozzles for your various cleaning needs, together with an onboard detergent tank. With the added power it can give a deeper cleaning to any surfaces, including the concrete driveways and siding. With its 25-foot high-pressure hose, you can cover a lot of ground as well. Given the power of the motor, the company has also put a child safety lock on the trigger-style spray wand. For the sake of preventing any accidents, while the lock is on, you can turn the machine on, but you can’t use the hose without disengaging the safety measure. Karcher designs products that can be used by anyone, for cleaning just about any surface imaginable. Their machines almost do the entire work for you. The 3 Karcher pressure washers we mentioned today are solutions you can use for cleaning patio furniture, your driveway, fences, windows, cars, and sidings. The gas-powered cleaners offer you a larger PSI output and a deeper cleaning when compared to the electric models. Karcher started out as a family-owned business in Germany and this has continued to be an unbroken tradition. The Karcher brand story began when its founder Alfred Kärcher focused on industrial heating elements in 1935. It grew to a multi-billion-dollar company which now focuses on cleaning equipment and tools. This change was largely thanks to his wife Irene Kärcher, who decided that the company should shift to developing household cleaners. She took over the company when her husband had passed away. Today, Karcher now provides jobs for over 10,000 people, spanning over 100 subsidiaries in 60 countries, bringing in around 2.84 billion dollars annually. Karcher is the first company to develop the first European hot water high-pressure cleaner in 1950, a product so revolutionary that it’s still used as a basis for many other Karcher products. As a company that has existed since the 1930s, it has gone through several changes but it has tried to keep a high standard of quality. Two major clients are NATO and the US military since they use Karcher as its primary supplier of cleaning solutions and systems. Over the years they have also participated in numerous cultural projects. They have been part of over 90 cleaning projects involving building or structures of cultural significance around the world. This includes, but is not limited to the Space Needle in Seattle, Mount Rushmore National Memorial, the Statue of Liberty in New York City, the Colossi of Memnon in Luxor, Egypt and others. Not everything is built to last, but this is, of course, true for any tool or appliance. However, Karcher offers high-quality cleaning systems for your home and for commercial usage. The warranty ranges from 2 to 3 years depending on the model. Some parts can have a special, separate warranty. The company can be contacted via email or through their customer service hotlines. When facing a problem regarding a broken or non-functioning product, you can take your device to a service center or try to go for their “rapid exchange program”. Their warranty guarantees a new device if the unit (or one part) is broken and cannot be economically fixed. As Pressure Washer Lab, we recommend using this service as it is faster than taking a whole pressure washer to the service center. Karcher has been developing cleaning equipment and system since the 1950s and has created many solutions we use every day. It offers products for your home from around 100 dollars, all the way to commercial cleaning systems that go to approximately 11,000. They even make municipal cleaning equipment like street sweepers, which can go for 50,000 dollars, and more. Karcher has invested a lot of time and effort into making cleaning solutions for every type of customer. As a company, they started with a primary focus on heating and other industry needs at the time. A decade and a half later, they made their switch to cleaning – both commercial and residential. From then on, that became their sole focus. They also comply with international ISO9001 and ISO14001 quality certifications. Furthermore, they have worked at establishing themselves internationally as their own name “Karcher” has become a colloquial synonym for outdoor cleaning equipment in countries like the USA, France, Poland, Germany, the UK, Mexico, and many others.